Actually it's past applesauce time, but started to panic that if Jim took a bunch back to FL with him that Dave and I would run out before a year's time! OH MY! Simple solution: make more applesauce. I'm so smart. Now normally I make applesauce about the first week or two of November so this is by far the latest in the year that I've made it. My choices weren't as good but there was enough to get a good combination. I also wonder about the sweetness of the apples or maybe it was just the combination I used. The applesauce seemed a little tart, but sweet. It's still good, but next time I'll make sure I get on the ball and make it by the second weekend of November rather than the last weekend of November. 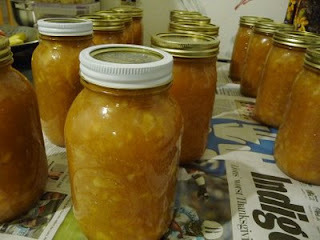 Since I was making a small batch I bought about 31 pounds which yielded 14 quarts of applesauce. I made Jim's with a tad less sugar than the "desert" kind that Dave likes.